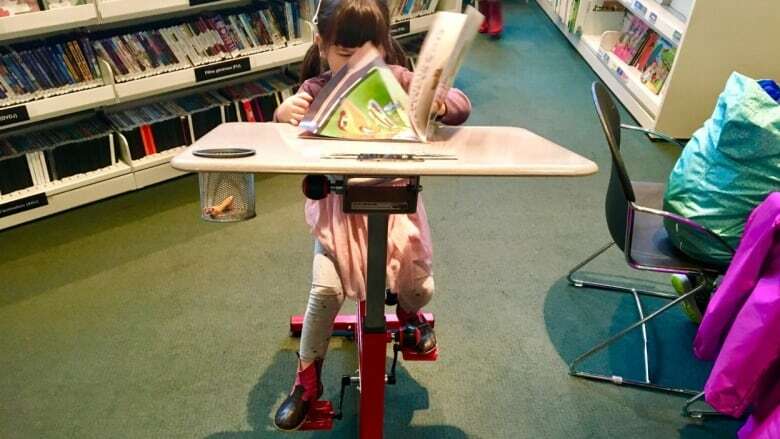 A total of 57 bicycle desks, for adults and kids, are being set up in 45 municipal libraries as a way to help people concentrate while they read. Library visitors across Montreal can now pedal while they read — exercising their bodies and their minds at the same time. A total of 57 bicycle desks, a mix of adult-sized and kid-sized, are being distributed to 45 municipal libraries across the city's boroughs. It's part of an ongoing effort to make libraries more universally accessible, say library officials, in this case for people who concentrate better if they are moving. Several bicycle desks have already been installed in locations like Outremont's Robert-Bourassa Library and, so far, they're a hit. "As soon as we walked in, the girls just climbed on and started to go," Rani Cruz told CBC Montreal's Daybreak. "They're really fun." Her children, aged nine, eight and three, found it so fun to bike and read at the same time, they wanted to go back again the next day. A lineup forms quickly at the Outremont library, Cruz said, and even if she can't read yet, her youngest enjoyed leafing through books while pedalling. "I think all the libraries should have them," she said. "There are a lot of kids that, when you go into the library, basically just run around and I think that might help." The Outremont library was one of the first to install bicycle desks which are essentially stationary bikes with a desk attached. The bikes are silent and organizers say there have been no complaints. 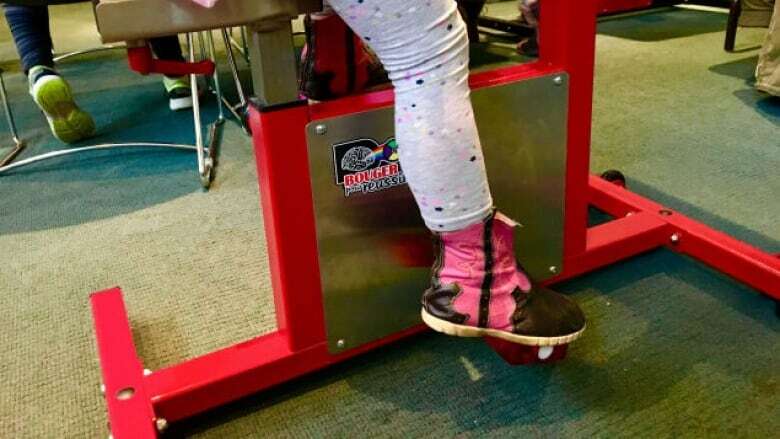 "The bicycle desk allows children to channel their energy by pedaling, which helps them to concentrate while sitting," librarian Élizabeth Jacques told Radio-Canada. At the Robert-Bourassa Library, there are two bicycle desks installed in the reading room, one for children and the other for teenagers and adults. The library also has set it up so that parents can read and pedal alongside their child "if they wish to encourage it." Natalie Martin, who has been working on the Montreal libraries' initiative, told Daybreak that the first five bicycle desks were installed in 2017 and the initiative proved successful. Now, she said, the bikes are being widely distributed and the usage will be monitored as the program grows. "For now, we are going to see how it goes — if the adults are as satisfied as the children — and maybe move them around just to adjust," she said. She said the desks can help people with attention disorders, like ADHD, concentrate, but they can also be good for those who have motor impairment or other conditions. More universal accessibility improvements will be unveiled in the coming months. "It's all part of making our services really accessible to everybody," she said.